Smartphones and tablets already dominate the mobile scene in South Korea, and their use is also spreading rapidly in developing nations, including two of the largest, China and India. What are the implications of this rapid spread? For South Korea, as shown in the first accompanying graphic (click to see a full size version), it means a saturated market at home and increasing competition from smartphone manufacturers in other countries, including China. 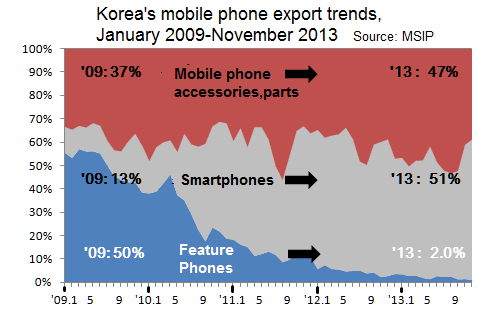 As shown by the grey shaded area of the graphic, over half of Korea's mobile-related exports near the end of 2013 consisted of smartphones and only 2 percent were the feature phones that dominated the late 1990s through the first decade of the new millenium. 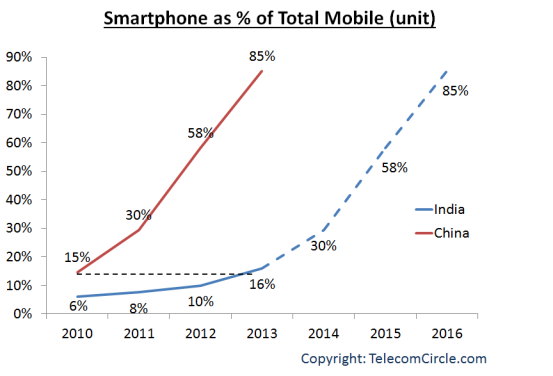 As shown in the second graphic, from a post on the Telecom Circle blog, by later this year 85 percent of total mobile units shipped in China will be smartphones, and India is expected to follow that trend within a very few years. Clearly smart devices are spreading around the world, including its developing countries, faster than anyone anticipated. However, this leads to some difficult questions about what the impact of this spread will be. What impact will it have on the digital divide, within countries and among nations? How will network designers and operators handle the flood of data generated in part by these devices? And the list goes on. We live in interesting times.